These 3 ingredient chicken tacos are so easy to make and so tasty – the perfect meal for those busy weeknights. 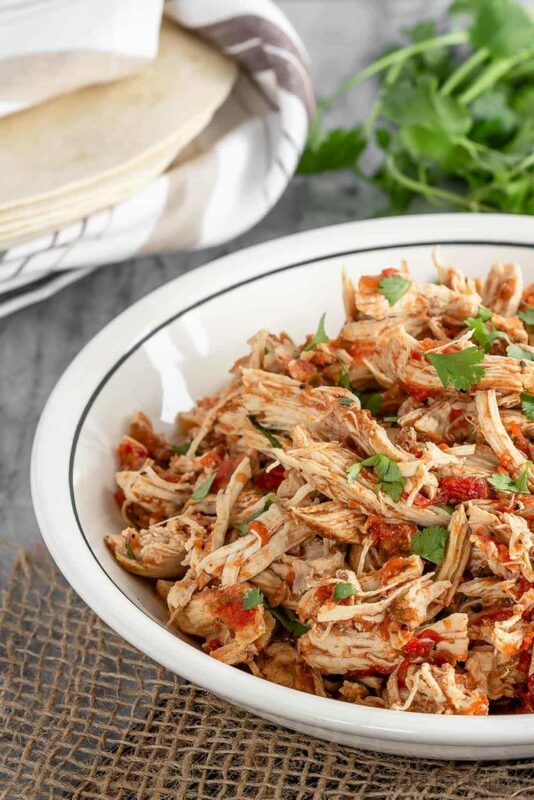 A 30 minute meal in your Instant Pot (from fresh or frozen) or let it cook all afternoon in your slow cooker for amazing chicken tacos! This chicken taco meat is amazing in soft or hard tacos, or on nachos! Chicken tacos. Just might be one of my family’s favourite meals ever. There are never any complaints when chicken tacos appear on the menu. And everyone loves that, right? Cheers when you call everyone to dinner instead of groans when they see you’re serving something crazy and horrible like mashed potatoes. Yup, that’s right. My kids hate mashed potatoes. What kid hates mashed potatoes?! And yet they’ll eat this slow cooker butter chicken, which most kids wouldn’t touch. So weird. Chicken tacos. They LOVE those, and I kind of agree. Whenever I don’t know what to make for dinner, this is inevitably what comes to mind. It’s just so easy to make, and I always have the ingredients. Might have to run out and get some taco shells, but I can do that while the chicken cooks so that’s not an issue. Or just toss the meat on some tortilla chips with some cheese for chicken nachos instead – just as amazing! I’ve been making this recipe in my slow cooker for years now – toss some salsa in the slow cooker, chicken breasts on top and sprinkle with taco seasoning. That’s it. Such an easy recipe and it can cook away all afternoon while I’m doing something else. Now that I’ve finally gotten on board with the Instant Pot craze and started pressure cooking all the things, I even have options for this tasty meal. 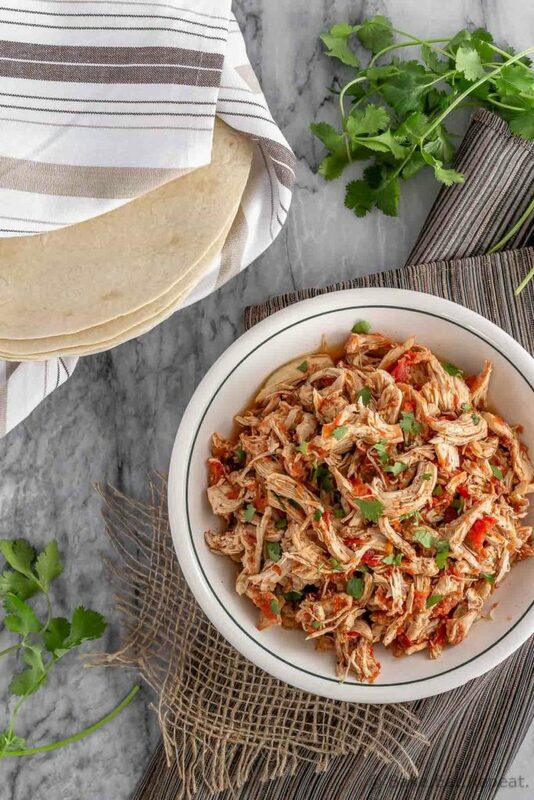 If you don’t have an Instant Pot yet, these chicken tacos are fantastic in the slow cooker, and I will still make them in there when I want it to cook all afternoon and be ready whenever we are. But as far as speed goes, pressure cooking is where it’s at! The ingredients are the same – but you can also cook the meat from fresh or frozen. I absolutely love that I can toss frozen chicken breasts in the Instant Pot with some salsa and seasoning and have it cooked perfectly in 12 minutes. That’s kind of insane. I may just love pressure cooking now that I’ve (finally) started! If you’re cooking this in the Instant Pot (I have the 8 Quart Duo, but it will work fine in a smaller model too), you can cook the chicken from fresh or frozen, it will just change the cook time a bit. If you’re making it in the slow cooker though, I would recommend using fresh or thawed chicken for food safety reasons. This recipe only takes 3 ingredients – chicken, salsa, and taco seasoning. I often have this taco seasoning recipe on hand so that’s what I usually use, but if I buy it I get this brand. The salsa gives a lot of the flavour to the chicken so use your favourite kind! If you have any leftovers, it keeps well in the fridge for 3-5 days, or you can freeze it for up to 3 months. It’s great for taco salads, tacos, or nachos for meals later in the week, or for lunches. These 3 ingredient chicken tacos are so easy to make and so tasty - the perfect meal for those busy weeknights. 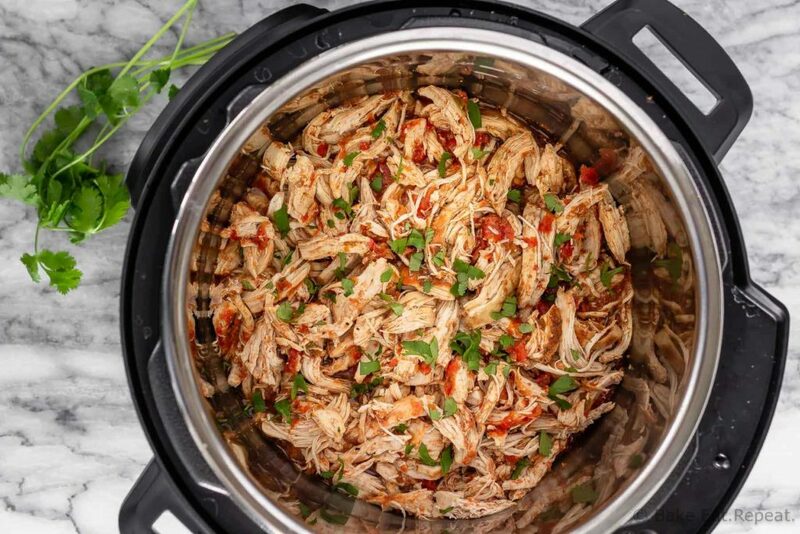 A 30 minute meal in your Instant Pot (from fresh or frozen) or let it cook all afternoon in your slow cooker for amazing chicken tacos! This chicken taco meat is amazing in soft or hard tacos, or on nachos! Place salsa in the Instant Pot, with the chicken breasts on top. Sprinkle the chicken with the taco seasoning. Secure the lid, making sure the valve is closed. Cook on high pressure for 12 minutes for frozen chicken, 8 for fresh chicken. The Instant Pot will take 10-15 minutes to come to pressure before the cook time starts. When the cook time is finished, let the Instant Pot naturally release for 5 minutes and then quick release the rest of the pressure. Use two forks to shred the chicken and mix it with the salsa in the pot. Place the salsa in the crock of the slow cooker, with the chicken breasts on top. Sprinkle the chicken with the taco seasoning. Put the lid on the slow cooker and cook on low for 4-5 hours or high for 2-3 hours. 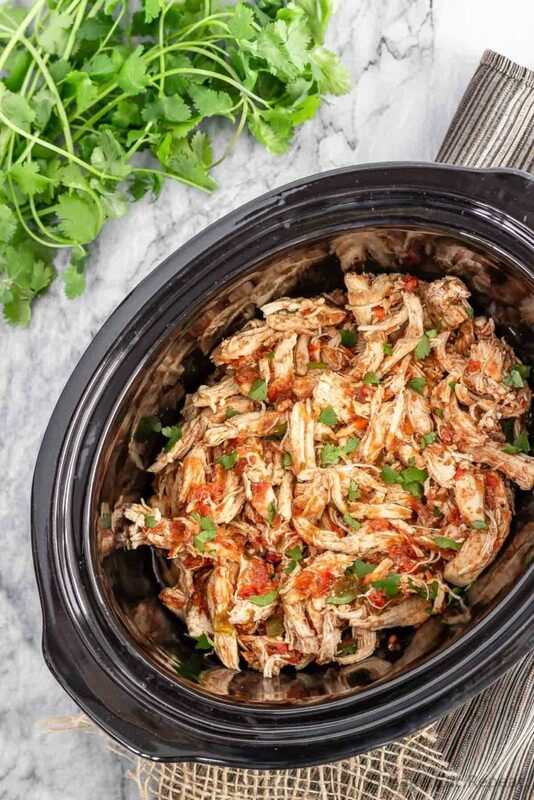 Shred the chicken with two forks and mix it with the salsa in the slow cooker. The cook time refers to the Instant Pot from frozen - adjust that according to the recipe directions if you are using fresh or cooking in a slow cooker. You can use either fresh or frozen chicken if you’re making this in the Instant Pot, it just changes the cook time by a few minutes. If you’re making it in the slow cooker, I would recommend using fresh or thawed chicken for food safety reasons. Use the chicken in soft tacos, hard tacos, on nachos, in burritos - however you like, with all the fixings! I like tacos, but I believe this recipe will do more wonders to my father in law, so will tell him about it. Keep up the great work! That chicken looks wonderful. I do something similar, but call it pulled chicken! I’m just too old and traditional for an instant pot. I enjoy taking my time in the kitchen.